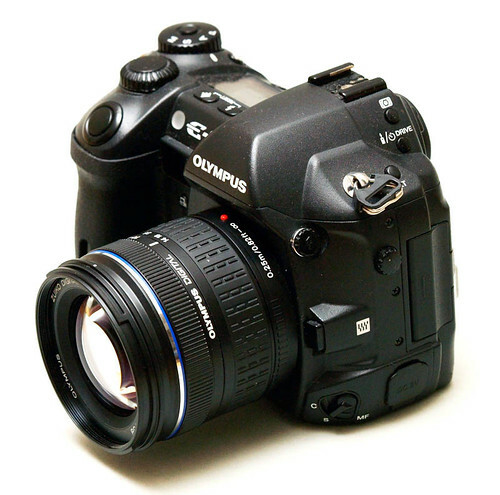 Announced in June 2003, the Olympus E-1 was the first interchangeable lens DSLR for the Four-Thirds system. Released at a premium price point, the E-1 was aimed at the professional market and as such features dust and water-resistant weather-sealing (to match the majority of pro-level Four-Thirds lenses) and very high build quality and robustness, along with Olympus' patented SSWF dust reduction system. The camera features twin control dials, an external white-balance sensor, an external x-contact port and can be used with a vertical battery grip attachment. Featuring a 5 megapixel CCD with the 4:3 aspect ratio, the E-1 has the same sized sensor as all cameras that share the Four-Thirds mount. Unlike all Four-Thirds cameras since its release except the E-3, the viewfinder in the E-1 is larger and offers 100% frame coverage – one of the main criticisms of the other cameras using the small Four-Thirds sensor. E-1s have been used in various harsh environments such as deserts and war zones, and as of 2007 remain reportedly one of the toughest SLRs ever produced. A successor to the E-1 was released in Nov 07 and is called the E-3.